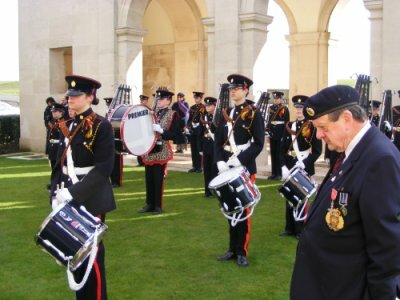 The 91st Anniversary of the 1917 Battle of Cambrai was marked with events over the weekend of Saturday and Sunday 22nd and 23rd November 2008. 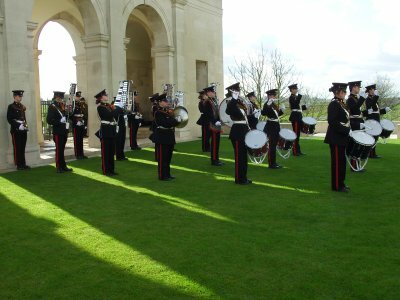 The weekend was greatly enhanced by the presence of the Band of the Army Cadet Force from Bristol who proved to be very accomplished musicians. On Saturday afternoon there was a solemn act of remembrance at the Louverval Monument to the many thousands killed in the Battle and who have no known grave. 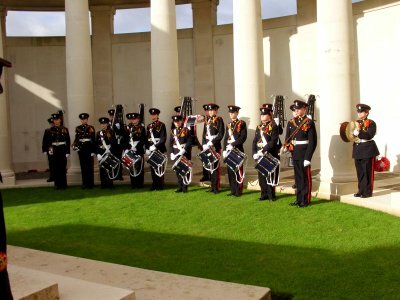 Following a presentation by the band, wreaths were laid and the Last Post sounded. 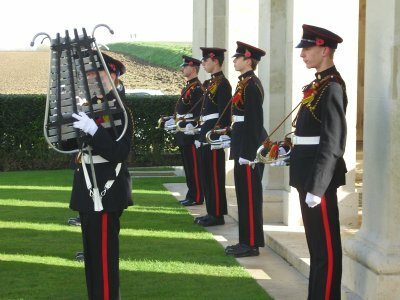 In a lighter vein, the Bristol Band then made a surprise visit to the Home and Museum of Msr Jean Letaille of Bullecourt and delivered a music interlude before presenting him with an engraved silver notepad. 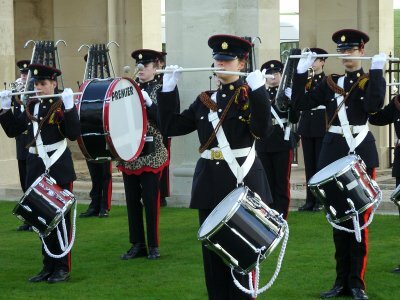 In the evening the Bristol Army Cadet gave a concert to a full audience in the church at Flesquieres finishing with a rousing demonstration on the drums only. 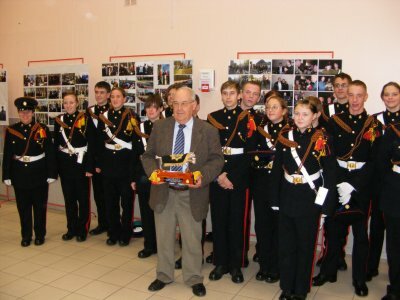 In the Salle des Fetes after the concert the Mayor of Flesquieres was presented with an engraved mounted bugle to signify the close friendship between the Bristol Army Cadet Force and the village of Flesquieres. Finally, on Sunday morning a further act of remembrance was held at the Monument to the Nations who fought in the Battle of Cambrai at Flesquieres, this being the first occasion since the unveiling a year ago. Again wreaths were laid. During the whole weekend there were representatives from the Souvenir Français, The Flesquieres Tank Association, The Royal Tank Regiment, The Royal Engineers and most especially, Mr Timothy Heap, the grandson of Frank Heap, Commander of the Tank, Deborah D51.